This hearty soup is perfect on those dinner nights when you simply want something light and warm in your tummy. A lot of cutting and chopping during food preparation but cooking it is super easy! Place the bacon in a large saucepan and cook over medium heat until crisp, about 8 minutes. Using a slotted spoon, transfer the bacon to paper towels to drain. Pour out all but 2 tablespoons of fat from the pot and return the pot to the heat. Add the onion and carrots and cook, stirring often, until the onion is golden, or about 5 minutes. Add the garlic and stir until fragrant, about 1 minute. Stir in the cabbage. Add the broth, 2 cups water, and the thyme, and bring to a boil over high heat. Reduce the heat to medium-low and cover the pot, leaving the lid slightly ajar. Simmer until the cabbage is very tender, about 45 minutes. During the last 5 minutes, stir in the bacon. Season with salt and pepper. Serve hot. 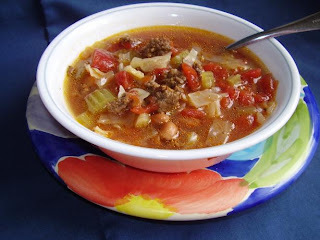 Note: You may also add cooked ground beef to the soup to make it more chunky! Ooh, I want to try this. Jed loves soup. Thanks for the recipe, Sam. Let me know what your hubbies think! By the way, don't follow the "6 strips of bacon" rule. I discovered that the more bacon, the better tasting it is! Nine months after, I finally cooked this. I love it. Great for light dinner on a rainy evening. Thanks Sam! Will include this in our monthly menu planner.